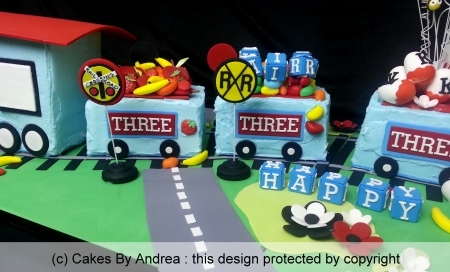 Cakes By Andrea designs premium birthday cakes for children in Brisbane. Please speak with me about a design just for you. I am a cake designer and spend many hours developing unique and beautiful cake design concepts for my clients. Unfortunately, there are other people who simply like to decorate cakes and they are happy to try and copy any picture a customer gives them, or that they find online, and charge a lower price for their lower quality copies. That’s why I don’t have full cake pictures on display, to protect my designs and keep them special for clients. I am happy to discuss the full range of design options with clients and welcome enquiries from those who appreciate quality workmanship and professional service. Enquire here. To see all custom cake designs for all ages visit the Custom Cakes page. Custom made carved fire engine birthday cake covered in red fondant with all vehicle components and accessories hand made from sugar past and 100% edible. Detail view of hand-crafted train cake: blue frosted cake on fondant-covered board and track. 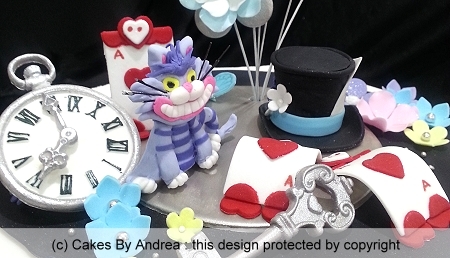 Every piece of decoration shown is hand-made from sugar paste by Andrea and is 100% edible. Colourful kids birthday cake featuring hand-made sugar paste xylophone, dimensional name letters and photo frame on frosted cake. Set on contrasting fondant covered board with colourful name inscription. If you’re looking for something less expensive and not custom-designed, check out these low-cost kids birthday cake ideas. Order a birthday cake topper and simply add it to your own cake (make it or buy it) for instant success! All my cake designs are original, designed and decorated by me. Because I focus on my own cake designs I do not copy other peoples cakes and I do not create copies of cartoon, Disney or superhero characters. If you would like something unique created for your child please contact me.